Edgarite: Mineral information, data and localities. Named after Alan D. Edgar (1935–1998), Professor of Petrology, University of Western Ontario, London, Ontario, Canada, in recognition of his contributions to the study of alkaline rocks and synthetic equivalents. An unusual sulphide mineral that appears to have formed at a very late, or final, stage of metamorphism, after the main event of fenitization, from a highly reduced, subalkaline S-C-H-rich fluid, which may have remobilized Nb as a result of destabilization of oxide minerals (Barkov et al. 2000). The first mineral showing chalcophile behaviour of Nb. Also the first mineral with reduced Nb cations. Graph shows reflectance levels at different wavelengths (in nm). Top of box is 100%. Peak reflectance is 40.2%. 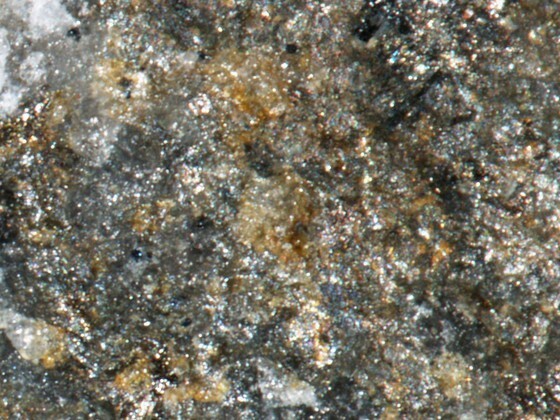 Platy inclusions in Ti-(V)-rich pyrrhotite and ferroan alabandite, and as dark gray aggregates of platy grains. In a feldspar-rich fenitized xenolith approximately 200m across in foyaite at the Khibina alkaline complex. Barkov, A.Y., R.F. Martin, Y.P. Men'shikov, Y.E. Savchenko, Y. Thibault, and K.V.O. 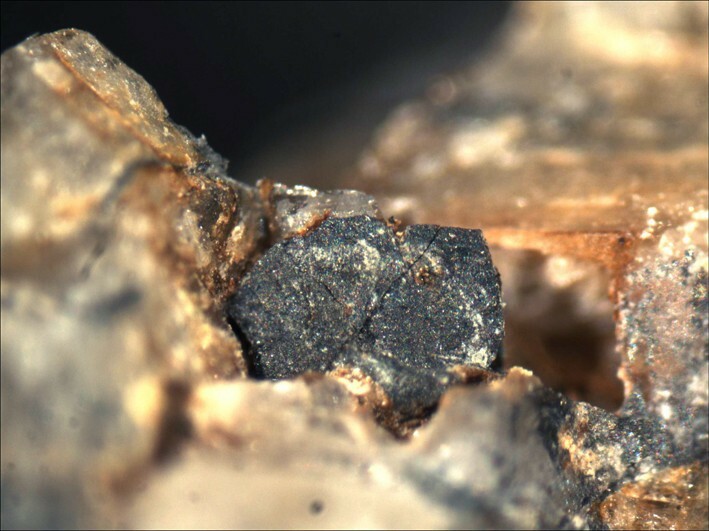 Laajoki (2000) Edgarite, FeNb3S6, first natural niobium-rich sulfide from the Khibina alkaline complex, Russian Far North: evidence of chalcophile behavior of Nb in a fenite. Contributions to Mineralogy and Petrology: 138: 229-236. Pyrrhotite 2 photos of Edgarite associated with Pyrrhotite on mindat.org. Anzenhofer, K., van den Berg, J.M., Cossee, P., Helle, J.N. (1970) The crystal structures and magnetic susceptibilities of MnNb3S6, FeNb3S6, CoNb3S6 and NiNb3S6. Journal of Physics and Chemistry of Solids: 31: 1057-1067. Katada, Motomi; Herber, Rolfe H. (1980) Lattice dynamics and hyperfine interactions of the intercalation compounds FexTiS2 (x = 14, 13, and12) and Fe13NbS2 from 57Fe Mössbauer spectroscopy. Journal of Solid State Chemistry: 33: 361-369. Jambor, J.L., Puziewicz, J., Roberts, A.C. (2000) New mineral names. American Mineralogist: 85: 1843-1847. Bindi, L. and Martin, R.F. (2018) Edgarite, FeNb3S6, from the Khibina Alkaline Complex, Russia: Solution of the Crystal Structure. 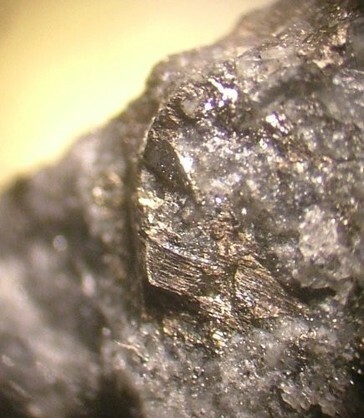 Canadian Mineralogist: 56: 259-264. Barkov, A.Y., R.F. Martin, Y.P. Men'shikov, Y.E. Savchenko, Y. Thibault, and K.V.O. Laajoki (2000) Edgarite, FeNb3S6, first natural niobium-rich sulfide from the Khibina alkaline complex, Russian Far North: evidence of chalcophile behavior of Nb in a fenite. Contributions to Mineralogy and Petrology: 138: 229-236; The Canadian Mineralogist (2000): 38: 1377-1385.